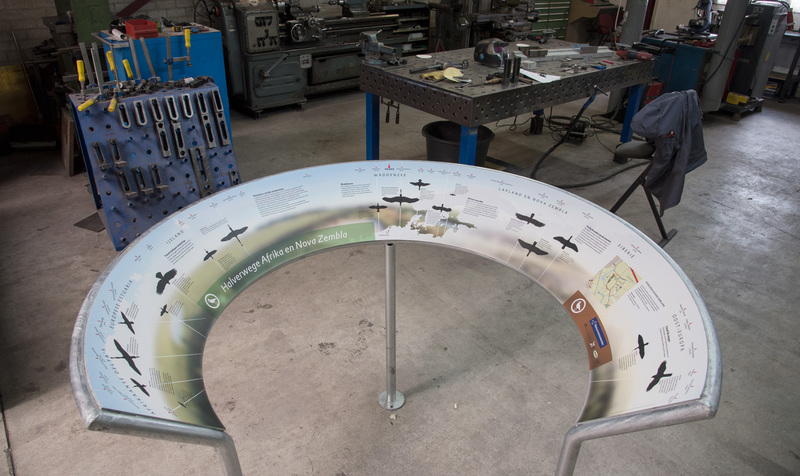 This project is a good example of what design can do, and how, by doing research, building prototypes and combining images, infographics, written stories and cycle routes, a great service to the visitor can be created. Regarding landscape related stories or visitor information, I have done many projects and written many articles, specifically about experiencing landscape. It’s a multi-faceted subject, ranging from geology and biology all the way to cultural history and art. The best season is spring. Lapwings, Godwits and Redshanks populate the skies. This panel is about their display flights and the reason why: no trees. Note how the materials, proportions and imagery blend with the landscape. This is our visitor. 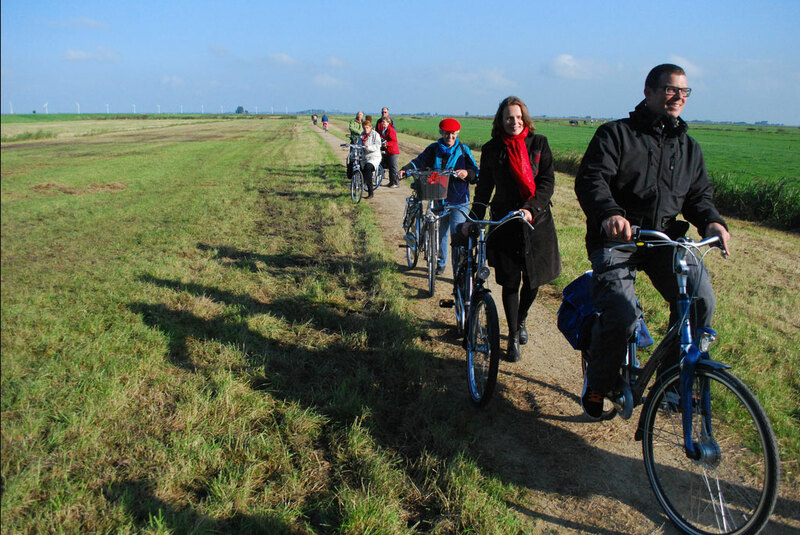 They like nature, they like cycling, they like each other’s company and they are willing to invest in learning if it enhances their experience of the landscape. 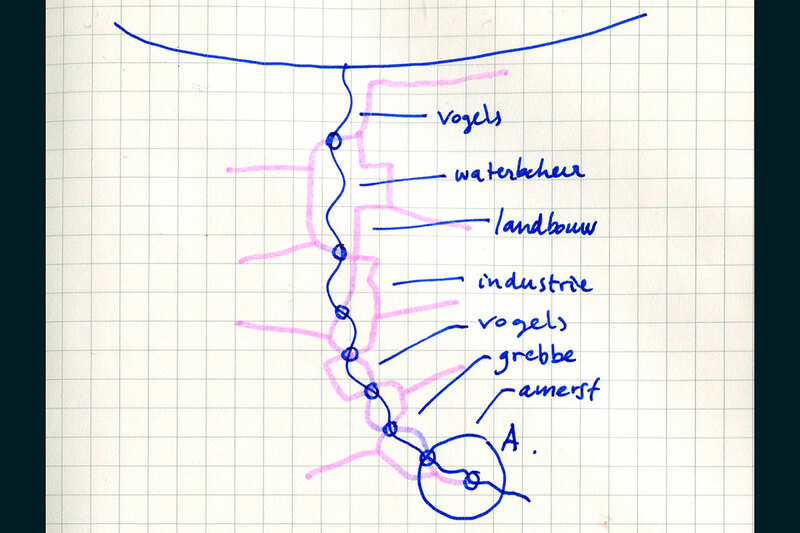 The very first sketch: cycling down a route adjacent to a small river, getting acquainted with multiple landscape-related topics. Park the bike, go to the viewpoint, drink in the views. It’s almost nostalgic. 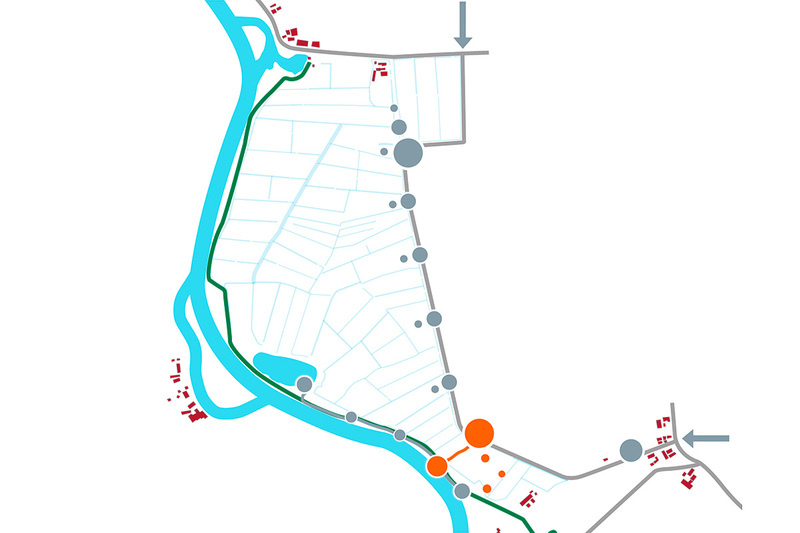 Detailed map of a small area, mapping ‘stopover points’ to use for visitor information. We chose 4, later. 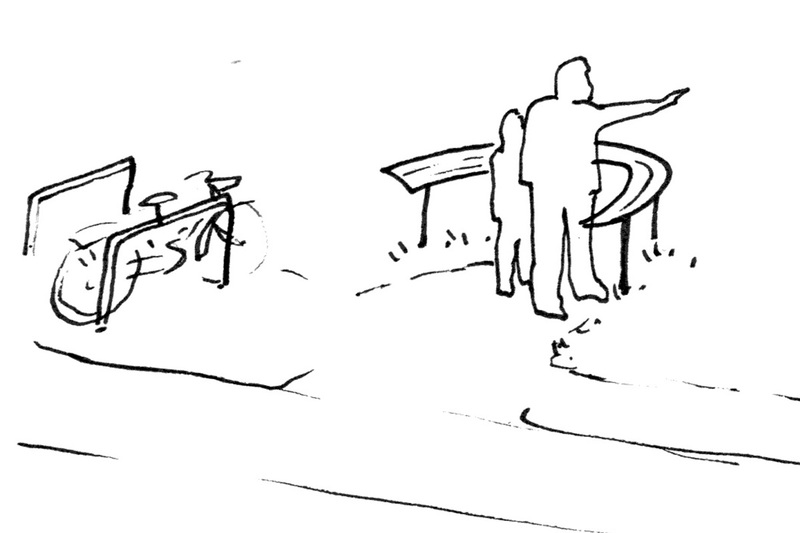 Big decision: no new objects in the landscape, no freestanding panels. Instead, we mount them on the gates. 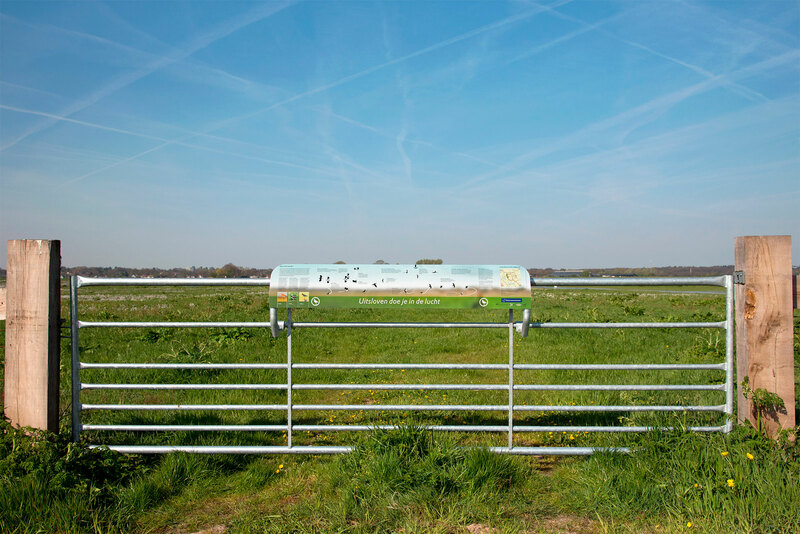 On the road-side of these gates, the ground is firm enough to stop and park on weed-permeable hardened surface. The panel is rock-solid, to withstand bovine rubbing. 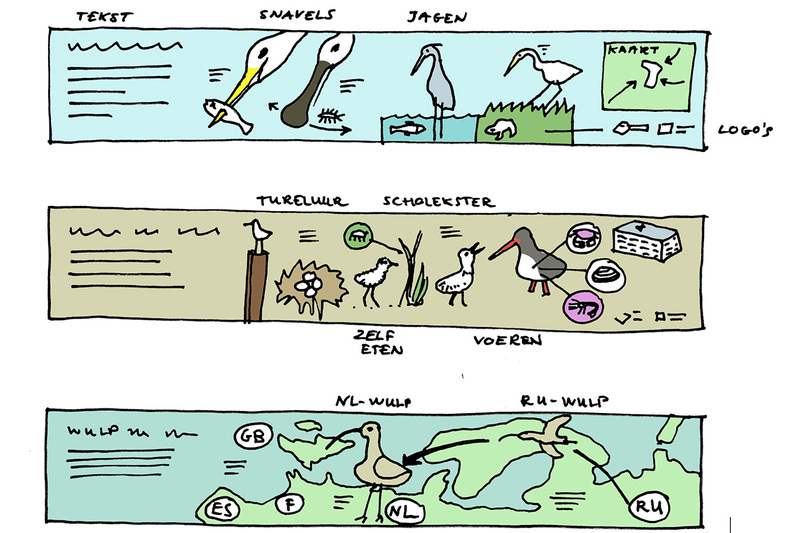 Sketching bird-based stories to shed light on the landscape. 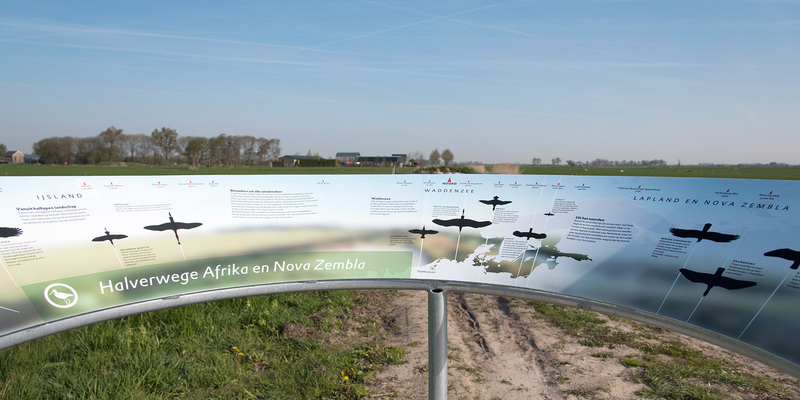 One of the information points is a viewfinder, showing which birds visit this very plot from Africa an Siberia on their migration flights. Many birds just visit for food form the neighboring woods and waters. They all meet here, every year. Incoming winter visitors on the big viewfinder. Distances and locations are marked on the brim of the panel. Some are in sight (a nearby hill), some are 3.000 miles away, in the same direction as some nearby sites. 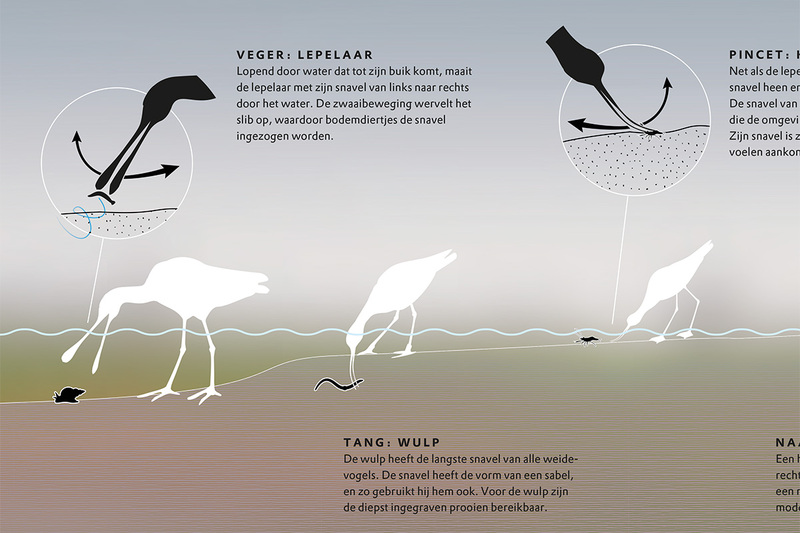 On each panel, three species are introduced with a full color picture. 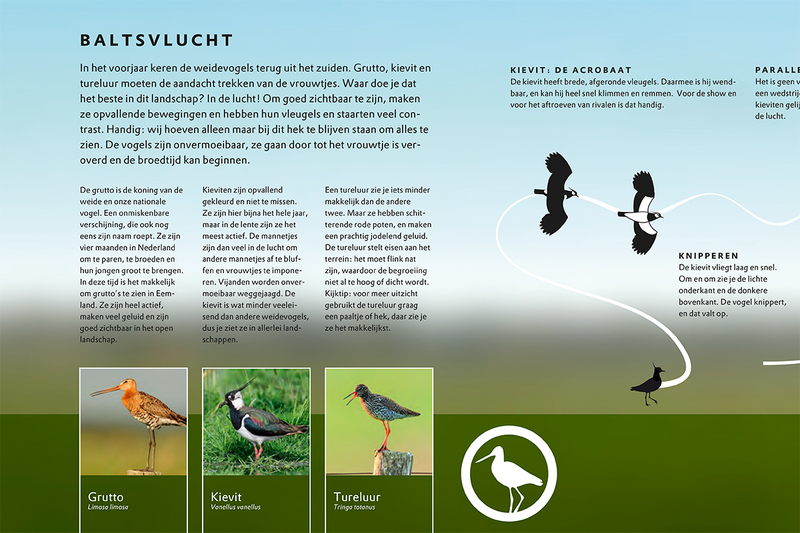 After that, all birds on the panels are silhouettes, because, unlike all other guides or information panels, these panels of mine pay zero attention to what birds look like in detail. It’s all about their behavior, and what it tells you about ecology, land use, soil type or cultural heritage. 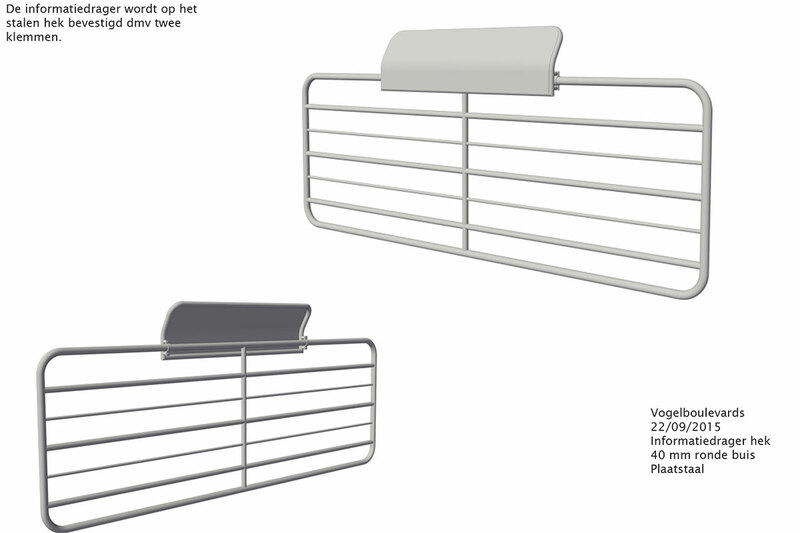 The panels are rendered unobtrusive by clamping them to existing fences. This explains their horizontal design, which (no coincidence) nicely aligns with the very horizontal nature of the landscape here. The background image on the panels is made from a photograph taken in the very same spot. This adds to the panel’s blending in with the landscape. Naturally, a digital version of the information was considered. 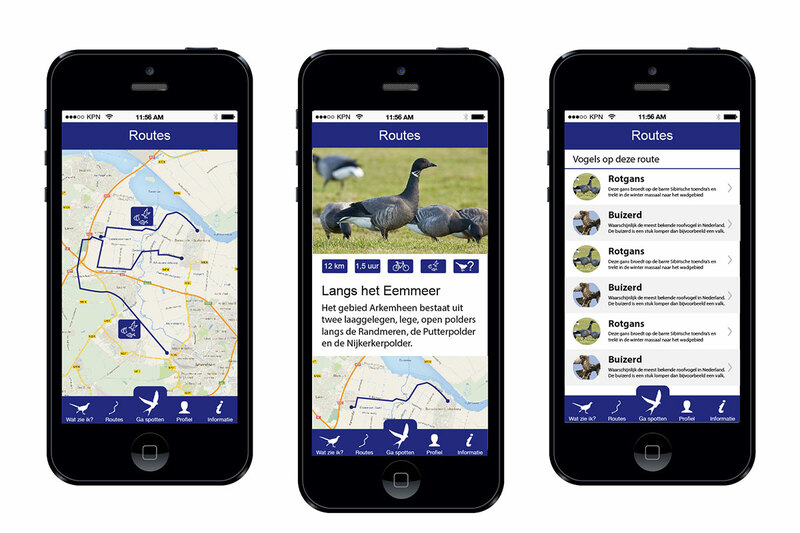 These mockups showed the client how the route, the bird species and the stories could be linked. In my opinion a digital screen competes with the fragile visual experience of landscape, competes for attention with the phone-less interaction in the group of cyclists, and needs a bandwith that is not available in an open landscape, and a mobile subscription for data use. 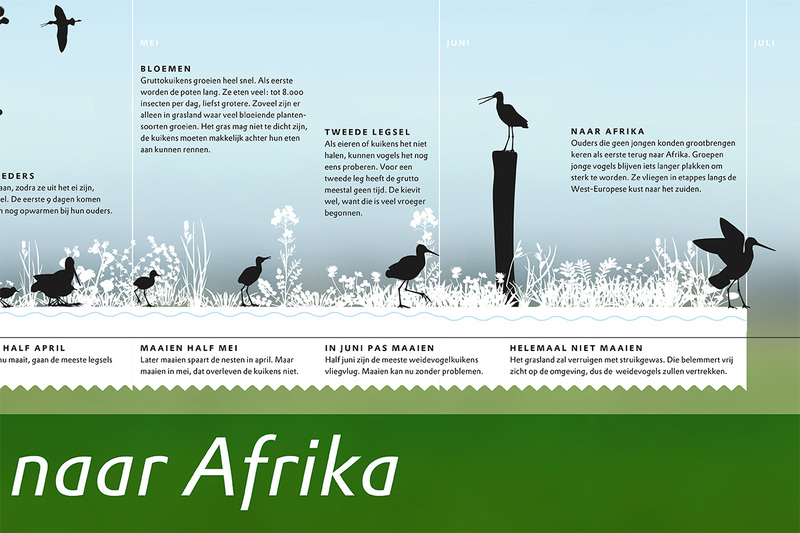 Papercut-like infographic, displaying a timeline for hatching of godwit chicks. Within 13 weeks form laying the first egg, the younglings fly to Africa. 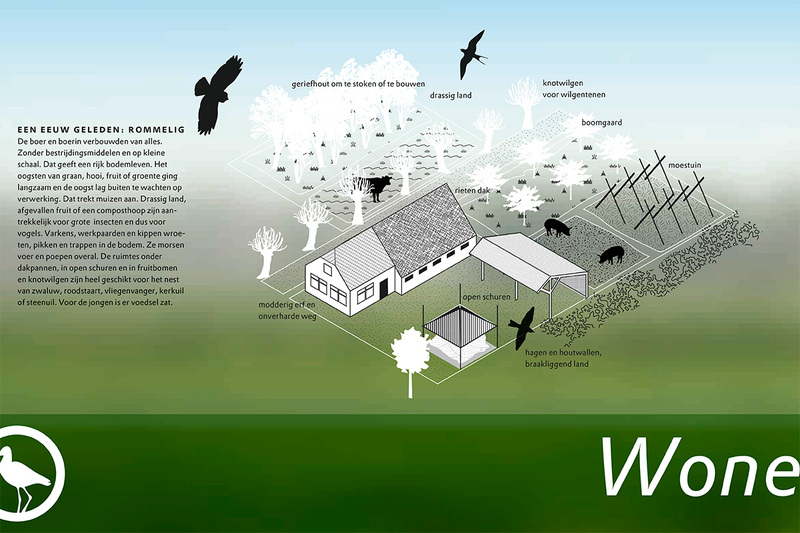 Very important and interesting is the fact that a lot of the endangered species on dutch farmland are birds that came from other habitats to populate the farmland centuries ago when it turned into a very attractive source of food and nesting places. 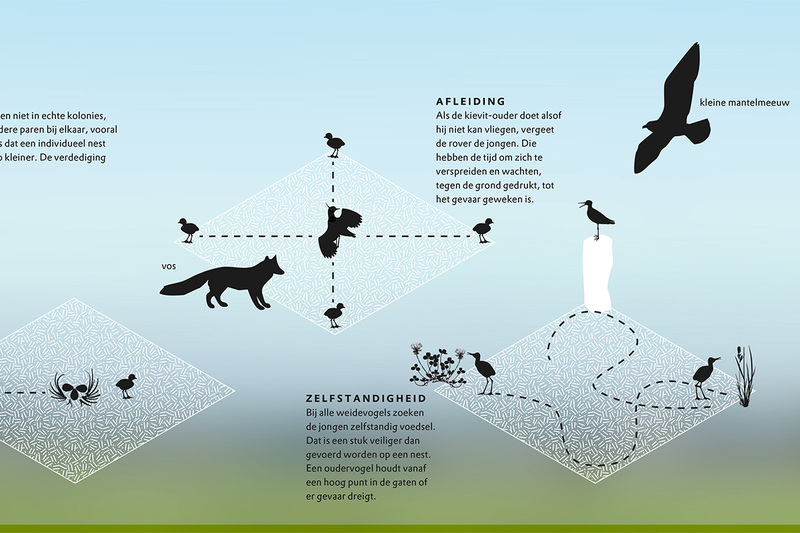 The current habitat these birds live in, is man made. 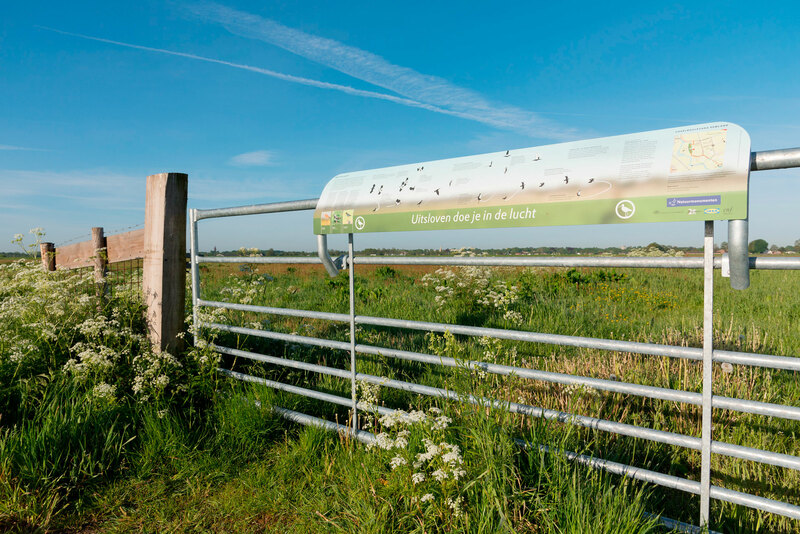 This means for the birds to stay, we need to either keep the landscape in a mid-20th century state, or create new ways of subsistence for the birds. 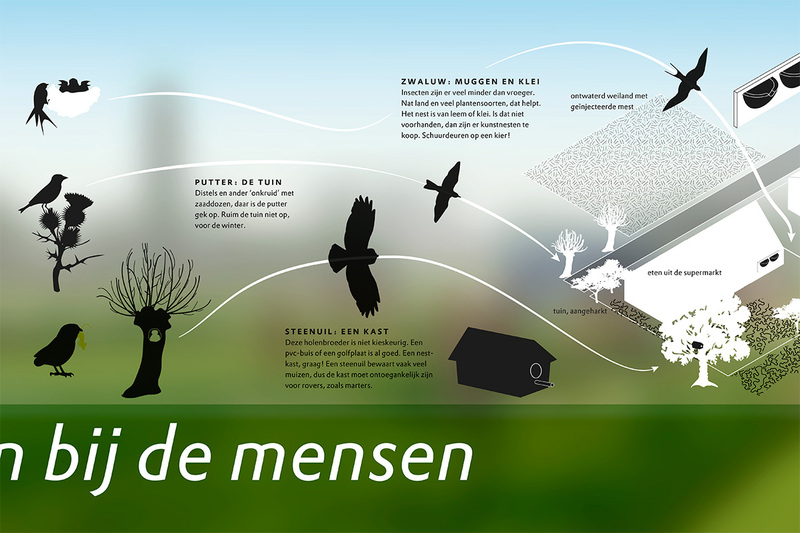 Since the birds are connected to the landscape, this also means survival of culturally interesting landscape types. 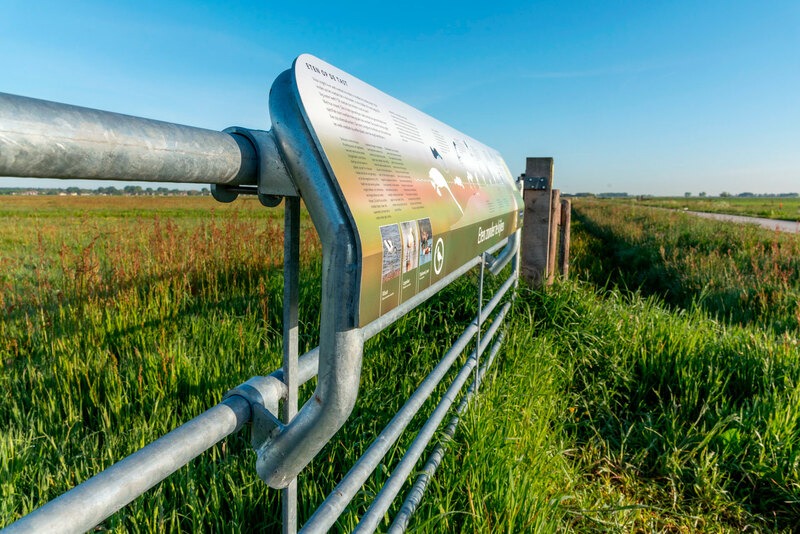 One panel is dedicated to cultural heritage, and the way many species have adapted to human use of the land and the accompanying buildings. As the old farms with nice and messy ways of working, hedges and willow trees disappear, the birds need to find a new home in more modern surroundings. How can we help? Use of space and territorial behavior is clarified by diagrams. In some places, inset diagrams are used to clarify invisible subjects. For more information, or to shed new light on your own landscape projects, feel free to call or mail me.